Published April 17, 2019 at 2:46 p.m. The Milwaukee Bucks' run to the NBA Finals continues tonight with the second spat in their seven-game series against the Detroit Pistons. But the fun and games don't need to be restricted to just the basketball court. 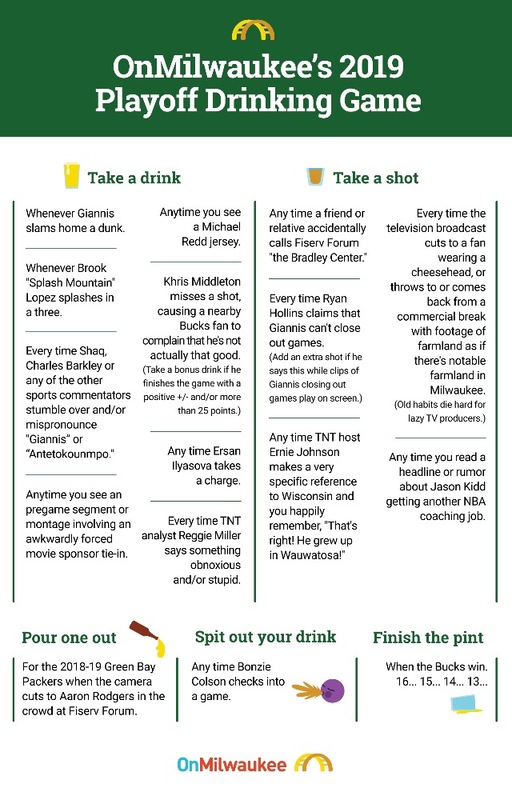 To help make the most of this playoff push – and by "make the most," we mean "drink the most" – we've created this half-serious, half-silly 2019 Milwaukee Bucks NBA Playoffs drinking game. Feel free to mix things and add some of your own rules to this list – and, of course, go Bucks go! Light it up, light it up! Whenever Brook "Splash Mountain" Lopez splashes in a three. Every time Shaq, Charles Barkley or any of the other sports commentators stumble over and/or mispronounce "Giannis Antetokounmpo." Any time Ersan Ilyasova takes a charge. Anytime you see an pregame segment or montage involving an awkwardly forced movie sponsor tie-in. Anytime you see a Michael Redd jersey. Every time TNT analyst Reggie Miller says something obnoxious and/or stupid. Any time a friend or relative accidentally calls Fiserv Forum "the Bradley Center." Any time TNT host Ernie Johnson makes a very specific reference to Wisconsin and you happily remember, "That's right! He grew up in Wauwatosa!" Any time you read a headline or rumor about Jason Kidd getting another NBA coaching job. For the 2018-19 Green Bay Packers whenever the camera cuts to Aaron Rodgers sitting in the crowd at Fiserv Forum. Any time Bonzie Colson checks into a game.